Recipes, Crafts, DIY, and Decorating, all done on a budget. Hopefully, finding a copy of the July 2008 issue of Southern Living, in the free pile at a library, was a good sign. My sister, a South Carolina resident for the past six years, assures me that I am going to stick out like a sore thumb. She has failed to realize that I have the guidance of some rather awesome women. 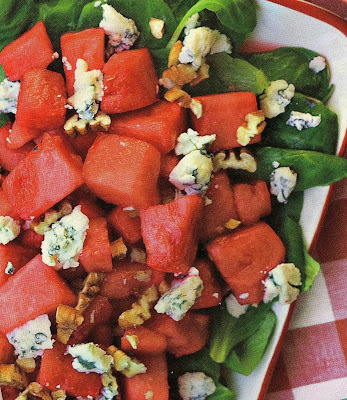 While studying my beloved issue of Southern Living, I came across a recipe that features watermelon and Gorgonzola. Cheese and chocolate can be blamed for my ample thighs, but darn it (see, see, sister, Jennifer, I am curbing my tongue), I can't wait to make a bowl of this salad. By the way, pecans are my very favorite type of nut. This goes back to junior high when Susan Henry's* mom baked pecan tassies. Susan brought them in her lunch bag, and my longing look, caused her to share. After school I raced home (sounds better than lumbered), begged my mom to purchase mini muffin tins, and the rest is history. Prep: 20 min., Bake: 7 min., Cool: 15 min. Mâche, a tender heirloom variety of lamb's lettuce, has a slightly sweet, nutty flavor, but the salad is equally good prepared with baby lettuces. 1. Preheat oven to 350°. Arrange pecans in a single layer on a baking sheet, and bake at 350° for 5 to 7 minutes or until lightly toasted and fragrant. Cool on a wire rack 15 minutes or until completely cool. 2. Combine watermelon and mâche in a large bowl; add vinaigrette, tossing gently to coat. 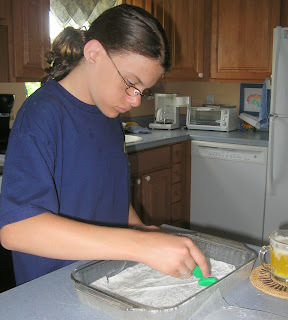 Transfer watermelon mixture to a serving platter, and sprinkle evenly with pecans and cheese. This is also terrific drizzled over a summery trio of sliced tomatoes, cucumbers, and onion. Whisk together first 6 ingredients. Gradually add oil in a slow, steady stream, whisking until blended. *Susan Henry, a former neighbor, and school pal, has the distinction of being the only person with whom I have ever gone shopping, who did not look at price tags. While I realize there are others for whom price is no concern, shopping for clothes with Susan was an eye-opening experience. We were looking for chic outfits to grace our pubescent figures, when she told me that her mom allowed her to buy anything. Even my best friend at the time, a girl whose parents handed her the Neiman Marcus catalog to make her Christmas list, looked at price tags. Are you paying attention, BG? There will always be people with a better wardrobe, and you better believe there are many kids out there who wish they had your closet. Because I love toile, I am excited to join in a party in its honor. 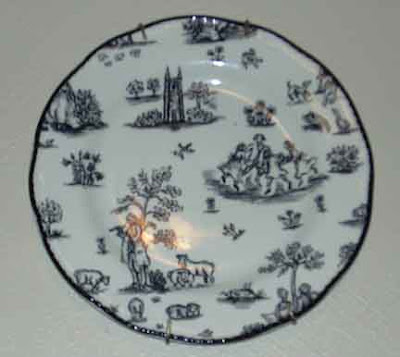 Go ahead and click on the Toile Party button for more pretty patterns. I like the dark wall color in the catalog photo. 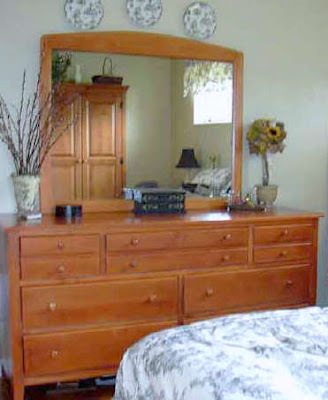 Our bedroom walls are Lowe's American Traditions Valspar in Belle Grove Light Amber. I chose this for our 1964 house, 'cause it feels like an old home, worthy of a National Trust for Historic Preservation paint color. In case you are new to my blog, that's supposed to be funny. Self-deprecation, or in this case, house-deprecation, is in my genes. The walls are a light amber, not the washed out shade that the flash produced. SH waking up on wrinkled sheets, and an empty duvet cover. Where is the duvet, you may ask. Well, for a very long time it was in the laundry room in need of a bath. It is now in linen heaven, because someone got grease and dirt on it. Mysterious things happen near our garage. We also have these plates in blue and white. They used to reside in a tiered plate holder. To give the illusion of endless counter space, I packed them away. Hey, that foot of extra space could be the deciding factor for someone who wants this house...right? 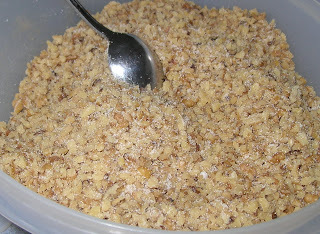 In a medium bowl, combine walnuts, sugar, cinnamon, and cloves. Brush butter on bottom of 9" x 13" baking pan. Place 20 sheets of fillo on the bottom of the pan, brushing each sheet with melted butter as you place in the pan. Cover with 1/2 of the walnut mixture. Layer 5 more fillo sheets on top, brushing each sheet with melted butter. Spread the remaining half of the walnut mixture over the fillo and cover with another 15 buttered fillo sheets. With a sharp knife, score fillo into 1 1/2" diamonds or squares. 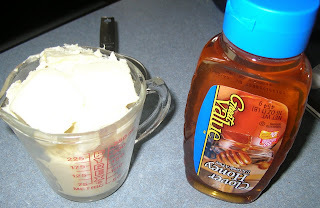 Brush top with melted butter. 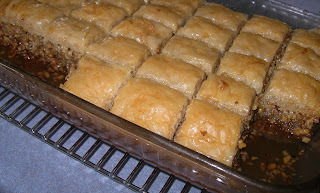 Cool slightly and pour warm syrup (recipe below) evenly over baklava. Cool completely, cut and serve. Bring all ingredients to a boil. Simmer for 10 minutes. Cool slightly. We attacked the baklava before it was cooled. 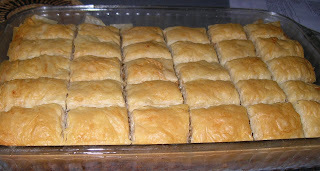 Baklava is also good frozen. The chewy texture is yummy.